With historically high gold prices we are currently enjoying, lots of investors are seeking ways to gain profit from selling their prized coins. On a given day, knowing the spot price of gold and multiplying your coins’ weight by this value while taking into consideration their purity, will get you an approximate dollar amount if you try to sell gold bullion coins. Please note that all dealers will charge you a fee for this transaction. Additionally, after a successful sale do not forget to claim these gains on your tax return. All physical gold sales are subject to Capital Gains Tax at a rate of 28%. We have done careful research and below we present the top online places that will pay you top dollar amounts. If you are trying to sell gold ingots, bars, coins, or other physical form of this precious metal, then USGoldBuyers can help. This is one of the top places to sell your gold online because they actually specialize in buying precious metals from individuals. Receive same day estimates and pay outs via PayPal, Western Union, banker’s check or wire. Moreover, it will not cost you a penny to ship your items, they are paying for it. If you have gold bullion for sale, BullionDirect is one of the best and most reputable online places to go about it. They accept the most actively traded coins and bars. If you are looking to sell any type of gold bullion, then GoldDealer is one of the top ten places to go. It’s your one stop dealer whether you want to mail in your items or you want to personally bring them into one of the shops if you reside in California. USAGold.com is one of the best online places to sell gold bullion coins. You will get a fair price and an ethical and honest evaluation of your coins. With the gold bullion market the way it currently is, you need a buyer who will not scam you. One of the top buyers in the market is Northwest Territorial Mint, so you know you will get treated honestly. Browse through the list of coins they accept and call to schedule the sale and lock in your payout amount. Follow their 3 easy steps listed online to effortlessly sign up, get your free shipping label and get paid on the same day. Check out their live chart of all precious metal prices they are offering right now. They are going even a step further by listing popular bullion coins with their prices they are currently offering for them. BlanchardOnline buys all types of bullion coins. This includes silver bullion coins and palladium coins, as well as the gold variety. They follow a strict protocol of assessing your items for sale and come up with very competitive offer that you can take or reject giving you and option. 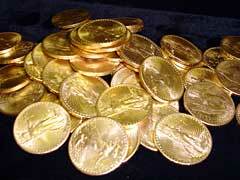 You can sell gold bullion coins to HuostonGold. Physically located in Houston, this company offers to mail in your items or bring them in person if you reside in the area. On the spot cash payments are a great way to sell your precious metals pieces. OnlyGold can help if you want to sell gold bullion coins to a top player in this market. This is one of the best places to get a fair price for your coins. Whether you are selling or buying, follow fool proof steps listed on their website and receive your money the same day. The Best Gold Prices is a great place to go online to sell your prized bullion portfolio. This company only deals in coins of all types and varieties, so you can be sure you are dealing with trusted experts in the Tampa Bay area in Florida. Come in person or sell by mail.